Investigation into the case of missing Saudi journalist Khashoggi is continuing and results are expected to come out soon, Turkish Justice Minister Abdulhamit Gul has said. The Istanbul prosecutors' office will reveal the truth behind the disappearance of Khashoggi, Gul said, adding that "whatever the international law requires will be done" to serve justice. In the meantime, U.S. resident and Washington Post contributor Jamal Khashoggi has long been feared killed after he entered the Saudi consulate in Istanbul on October 2 and was never seen leaving. The paper said that President Donald Trump last week said that Saudi Arabia would face “severe punishment” if the kingdom was found to have a link to Khashoggi’s apparent death. But he appeared to reject possible sanctions, claiming they could harm the United States’ deep defense industry ties with Saudi Arabia. Chinese daily The Global Times compared Western approaches towards missing Saudi journalist and former Russian agent Sergei Skripal. The daily criticized the U.S for “double standards” toward the case of Saudi journalist Jamal Khashoggi. In an editorial, headlined “Khashoggi case tests Washington’s attitude to human rights,” The Global Times said U.S. President Donald Trump promised punishment if the Riyadh’s involvement in Khashoggi's death is confirmed but he doesn't support stopping weapons sales to Saudi Arabia. "The crisis has shown how human rights issues are positioned in the diplomatic arena. Killing a journalist for political reasons touches the bottom line of individual rights and causes wide resonance beyond national borders,” the daily says. "The price it (Saudi Arabia) will pay depends on whether the Trump administration will let it off the hook for the sake of US commercial interests and geopolitical calculations." The daily compared the West’s approach toward missing Saudi journalist and former Russian agent Sergei Skripal, who was poisoned in Britain in March 2018. "Now the Western public opinion is much angrier towards Saudi Arabia. Spontaneous boycotts quickly followed. But in contrast, fewer denunciations come from the Western governments and no country is taking the lead in punishing Saudi Arabia," the newspaper added. Moscow would like "the world to learn the truth" about what happened to Saudi journalist Jamal Khashoggi, Russian Foreign Ministry spokeswoman Maria Zakharova said. "[We] would very much like the world to learn the truth about this story. Political statements should be made after the law-enforcement bodies have announced their verdict," she told a briefing. Moscow "welcomes the joint actions announced by Turkey and Saudi Arabia in investigating" the case, Zakharova said. In the meantime, U.S. legislators are calling for tough measures against Saudis over the continuing mystery around Jamal Khashoggi. A bill in the House of Representatives would halt arms sales to Saudi Arabia unless Secretary of State Mike Pompeo certifies the kingdom did not order the killing of Jamal Khashoggi. Massachusetts Democratic congressman Jim McGovern, co-chair of the Human Rights Commission and the ranking member of the House Rules Committee, took the lead on the legislation, saying reports about Khashoggi "represent a brazen violation of international norms." The legislation states U.S. military aid and sales to Saudi Arabia would be prohibited, pending confirmation from Pompeo on the status of Khashoggi. “If the United States stands for anything, we need to stand out loud and foursquare for human rights. Our values are our strength, and we cannot be indifferent or complicit when those values are undermined or attacked," McGovern said in a statement. 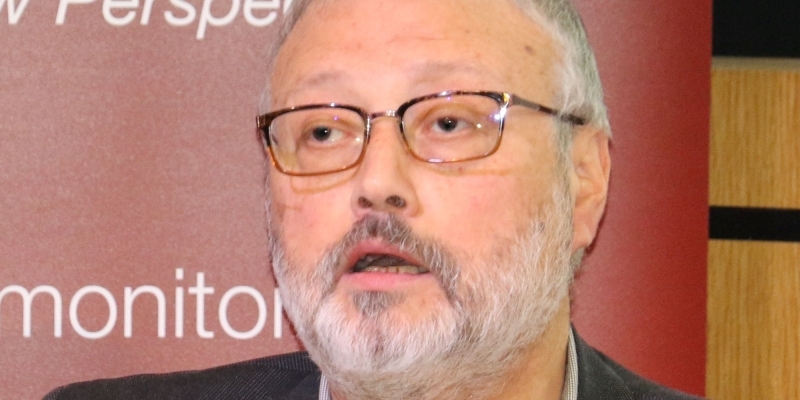 Multiple reports have cited audio and video recordings containing grisly details of his alleged killing at the hands of Saudi operatives after he entered the consulate. Other U.S. lawmakers have also taken similar stances on Saudi Arabia, saying sanctions are necessary if reports of the journalist's death are true. Republican Senator Lindsey Graham warned there would be "hell to pay" if Khashoggi was killed. The bill, introduced to the House on Tuesday, is being co-sponsored by six Democrats and two Republican lawmakers. Republican Senator John Kennedy said that while Saudi Arabia should be condemned if it is found to be behind Khashoggi's disappearance, the U.S. should stop short of "blowing up the Middle East" in retaliation. "You could expel diplomats. You could do a U.N. resolution. You could curtail arms sales. You could do sanctions on individuals," Kennedy said, according to the Hill news outlet. "Our foreign policy has to be anchored on values, that's America." Among the "number of options" the U.S. could pursue are sanctions, arms sales reductions and UN resolutions, Kennedy suggested. Amid the ongoing uncertainty over the fate of the Saudi journalist, French minister pulled out of the Saudi economic conference “Davos in the Desert”. In an interview with Public Senat, the Senate's broadcaster, Finance Minister Bruno Le Maire said he would not attend the Future Investment Initiative - nicknamed "Davos in the Desert" - hosted under the leadership of Saudi Crown Prince Mohammad bin Salman, set to be held on October 23-25. "For the moment there are serious facts here," he said, adding that the case must be fully illuminated and thus he will not go to Riyadh. Le Maire stressed the decision would not threaten the strategic partnership between the two countries. Participation in the conference is thinning, with many major figures announcing that they would not attend due to the Khashoggi issue. On Wednesday, IMF head Christine Lagarde announced her cancellation, as previously had World Bank President Jim Yong Kim and executives of major global firms - including Uber, Ford, AOL, Viacom, JPMorgan Chase, Google and the London Stock Exchange Group. Saudi authorities have yet to give a clear explanation of Khashoggi’s fate, while several countries - particularly Turkey, the U.S. and the U.K. - have expressed their desire that the matter should be elucidated as soon as possible.